Another wonderful Gujurathi recipe from my m-in-law. This is a hearty soup that is perfect for those cold days! And it is really simple to make. Keep a lot of the spices on hand, and you can whip this up any time. The key to cooking is to have a really well stocked kitchen, then you can make anything you want anytime. Ok here is the recipe now! 1. Dice up your vegetables into small pieces. Think Campbell soup size. Boil them just covered with water, turmeric, and salt, and a bit of orange rind. Any vegetable should work theoretically . Make sure you add tomatoes. This add's a key flavor to this soup. 2. Pressure cook tuvaram parupu - toor daal, in the ratio of 1:4, daal:water. I would say for a 2 quart saucepan, you'd want to add at least 3/4 cup of daal. (This measure is before you cook the daal!). 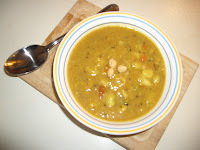 But you can adjust to your taste, if you like the soup more watery or more daal-y. My husband prefers the former, and I the latter. So I just add hot water to mine to adjust to my taste. I would say at least 4-5 whistles on the pressure cooker. 3. Add the parupu - daal to the veggies, add about a 1.5 tsp of omam - ajwain. Again to your taste, experiment and see how you like it. Add water if you need to thin out your soup at this point. I keep a kettle on during this so I can add hot water and not bring down the temp of the soup by adding cold water, which will just take longer to boil. 4. Roll out a dough, made from atta (whole wheat flour), omam - ajwain, chili powder, turmeric, salt, and water. It should about 1/8 of an inch thickness. Cut this dough into diamonds and drop them into the boiling soup. Let it cook for a few minutes. 5. Splutter in oil; mustard seeds (1 tsp, let this splutter first), then add jeeragam - cumin 1tsp, chili powder (1 tsp), perungayam - asafoetida(a dash), kraambu - cloves (2) crushed, and cinnamon(1/4 tsp). I found this old post while looking for dal dhokli recipes. we add peanuts to the dal, and always lemon juice and cilantro. I'm going to take your suggestion of chopping up all veggies in small pieces. 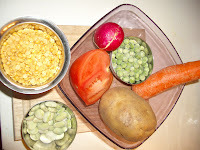 I make the dal on a weekend, and freeze some dhoklis so this can be a quick weeknight meal.